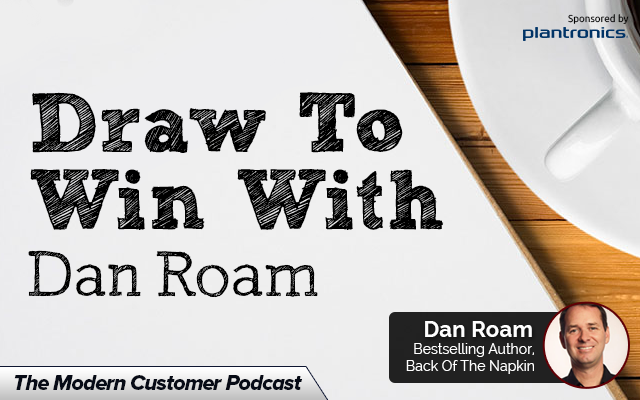 Dan Roam will always be your most interesting dinner party guest, not just because he will explain complicated topics to you on the back of a napkin. For years he has been espousing the benefits of communicating through simple images. He broke ground with this bestselling book Back Of The Napkin, and has recently released a new book called Draw To Win: A Crash Course On How To Lead, Sell and Innovate With Your Visual Mind. In the book Roam provides the tools necessary to thrive visually, using step-by-step diagrams and easy-to-master lessons that will make you an expert in communication and creativity. Think this isn’t relevant for customer experience professionals? Think again! Simplifying content for customers should be priority number one for every brand. Gone are the days when customers had the attention span for long wordy documents explaining terms of service, how-to content, or self-help guides. Learn from Roam what you can be doing to improve your customer communication through images. An internationally bestselling author and the founder of the Napkin Academy, the world’s first online visual-thinking training program, Roam has helped leaders at Microsoft, Boeing, eBay, Kraft, The US Navy, Senate and many more solve complex problems with simple pictures. You won’t want to miss this episode of The Modern Customer Podcast.